CICK HERE FOR ALL YOUR SEAT NEEDS! After modifying basically all of my personal cars at one point or another I can safely say that one of the best improvements or modifications I made was installing a well fitted seat. Installing a well fitted seat helps to remove any unnecessary lateral movement and I’m sure you can recall throwing the car into a corner with confidence just to find yourself holding on for dear life because of the lateral G force pushing you out of your seat. In this article, I wish to inform you of the components of a fixed back seat and what it takes to install a fixed back seat. It should be understood that all the seats we offer are going to be universal; not vehicle specific. Each seat will be either bottom and/or side mounted. We are going to jump right into seat mounting so let’s start from the bottom and work our way up. First we will have a vehicle specific seat base. Then an optional slider track set (allows movement forward and back). You have your vehicle specific seat base, optional slider track set and the next component would be the actual seat. All of these components should be fastened with the manufacture recommended bottom/side mount hardware kit. If you choose a side mounted seat, then you will need side mount brackets in addition to the base, sliders and hardware. The side mount brackets can be bolted to the sliders or directly to the base if you choose to not use sliders. There are two types of side mount brackets, offset and standard. Offset brackets are used when the seat you are installing is the same width as the mounting holes on the base or sliders, and standard brackets would cover the lower mounting holes. Installing a seat is relatively straightforward. When installing my seats, I first started by preassembling the seat with the necessary mounting components outside of the vehicle. This next step is a necessary safety precaution. While wearing the appropriate personal protective equipment disconnect the negative cable on the battery and be sure to remove any leftover charge in the vehicle’s electrical system by pressing on the brake pedal for a few seconds. Disconnecting the battery is very important when removing any airbags or disconnecting airbag sensors. Next I moved into the cabin of the car. A stock seat is usually only mounted by approximately 4 bolts, which secure the base to the chassis of the vehicle. Remove the stock seat mounting bolts, make sure all wiring harnesses below the seat are disconnected and remove the seat from the vehicle. Next, take your preassembled seat and maneuver the seat into the cabin of the vehicle, this might be a little tricky so be patient. Finally, fasten down all chassis connecting points and double check all seat mounting component connections as well. I used the term “well fitted” earlier and I’d like to elaborate to give you some perspective. I currently weigh 180 LBS, stand at 5’10 with a size 32 inch waist. My personal favorite seats are the Sparco Pro2000 and the Sparco Evo 2 because they hold my hips in position and their high bolsters provides for lateral thigh support. The main difference between the two seats is going to be the kidney bolster support because the Pro2000 is going to be slightly more aggressive therefore provide more support. Therefore, I would consider the Evo 2 more suitable for more frequent use or getting in and out more frequently. Another item of business to consider is the seats FIA certification. FIA stands for Federation Internationale de l’Automobile and it was founded in 1904 in Paris, France. The FIA is the governing body for motorsports worldwide. According to FIA standard 8855-1999, the usable life of a FIA certified seat will be 5 years from the date of manufacture indicated on the seat. An extension of up to 2 further years may be authorized where the seat has been returned to the manufacturer for re-validation. This certification is not necessary in all types of racing, therefore I recommend consulting your local racing program and its standings regarding certifications. I hope this article was informative and an enjoyable read. As I said, a properly fitted seat is one of the best car to driver and driver to car upgrades you could possibly do. If you have any more questions, myself or any of my other coworkers would love to assist you. One of the most overlooked items when preparing for your first trackday seems to be a helmet. Too many times do I see newcomers showing up to a trackday, drift event, or autocross expecting to pass their standard DOT rated motorcycle helmet they have used hooning around in middleschool on their dirtbike. In this feature of Through Our Eyes we will be talking about helmets specifically designed for motorsports both for the serious competitor and the casual trackday goer. To start things off let’s talk about the typical construction of a helmet which is comprised of a hard outer layer, a softer polystyrene or similar material interior, as well as an even softer padding layer for comfort. This combined with a chin strap as well as an assortment of other accessories like visors, air masks, radios, and so on typically make up most road racing helmets today. The hard outer shell of the helmet as well as the inner polystyrene material are easily the most important features of any helmet when it comes to the safety and well being of the person donning the helmet. The hard outer shell allows the point of impact to the helmet to be spread across the surface absorbing the initial shock of the collision, the polystyrene interior of the helmet is meant to absorb the impact by crushing when the driver’s head meets the resistance of the outer layer and the force behind it, softening the blow to the head. The most important feature to consider when purchasing a helmet would be the construction and standards designed to keep your brain intact. Many of these standards come down to the intended use of the helmet and in most circumstances one rating does not fit all. There are two organizations here in the United States responsible for setting these standards, the first being the Federal Government’s Department of Transportation or the DOT and the second being the Snell Memorial Foundation. The DOT helmets for the most part are not recognized by any racing organization as qualified to protect your noggin so today we will be focusing on Snell approved helmets. It is true that Snell offers many different helmet ratings and determining which is best for your needs can be overwhelming, but the two most common of these ratings will be either the M or SA ratings. All of Snell’s ratings are followed by a number in a format like SAxxxx. SA2010 for example would be the most recent rating available for automobile racing which Snell updates every 5 years with new standards as they see fit. The motorcycle alternative M2010 is also available in a similar format but the differences between the two are vast. The M rating is given to motorcycle helmets which pass Snell’s standards and while the M rating may be recognized by many grassroots racing and trackday organizations a Snell SA helmet is designed specifically for automobile racing and the collisions that may be associated in a car versus a motorcycle. The Snell SA rating is typically found inside the helmet, possibly under some padding complete with a serial number for that specific helmet model. Most trackday or grassroots racing organizations will allow the previous two ratings at their events. At the point of this article being written both SA2005 and SA2010 are widely accepted, but it is always best to have the newest helmet possible due to wear and tear over the years and material degradation. Another vital element in the performance of the helmet you select is the size of the helmet. For the helmet to perform properly in a collision it must be secured to the head with the chin strap, it must be snug, but not too tight to cause discomfort. Everybody has a different sized head and while most helmet manufacturers have a pretty accurate fit across the board. Some brands run large and some run small, just like when picking out shoes between your favorite brands. Most manufacturers sizing charts can be found on the pertaining manufacturer’s website to give you an idea of the variances when purchasing online. To find the proper size of your helmet you would want to measure with a flexible tape measure around your skull, approximately one inch above your eyebrows around your head, following the band which a baseball cap would typically fit, this allows you to find the circumference of your head which is the standard in measurements when it comes to helmet sizes between brands. Once you have a helmet it is important to test a few things concerning fitment. Remember that helmets should be snug and if you have the ability to loosely put the helmet on without any resistance then you may have to go down a size. Once you have the helmet on the next test would be to check horizontal and vertical movement around your head. Move the helmet up and down or shake your head side to side, if there is excessive movement with little to no resistance you will want to move down a size until the helmet is snug and unable to be moved so easily. Next would be a strap test to check fitment with the strap latched, with the strap latched securely to your chin attempt to rotate or roll the helmet off your head. If there seems to be no space to do such a thing it is likely a proper fitting helmet, but if the strap is unable to keep the helmet on your head you will definitely want to go a size or two smaller. Many other tests can be done when trying helmets on and no two heads or helmet models are alike. Trying on a variety of helmets may be required to find the proper fit for both comfort and functionality. Finally when selecting a helmet you are going to want to choose a style which works best for you. There are many styles of helmets available from open face to basic closed face designs and more advanced closed faces with accessories like air ports, radio ports, or connections preinstalled for HANS devices. There are no differences in safety between these helmets and their associated price tags when it comes to the Snell SA rating. There is only one Snell SA rating and any helmet that passes that certification is just as qualified as the next. The biggest difference between all the brands would be materials and accessories available to the user. Most autocrossers or average trackday enthusiasts will require the most basic of Snell SA rated helmets. Some may even opt for an open faced helmet to keep the helmet as least intrusive as possible, although we recommend checking with your local track event organization to confirm that open face conforms with their rulebook as some organizations prefer closed face. For the more experienced road racer a more aggressive helmet designed with more comforts like air masks with a port to duct fresh air for the driver usually for long stints in the cockpit. Another safety feature often included with higher end helmets would be HANS device attachments which are typically required for more aggressive road racing organizations. To wrap things up when it comes down to selecting the helmet for your needs you will have to gauge how much you want to spend and what sort of track driving you plan on taking part in the future. Most entry level organizations are fine with a standard Snell SA2005 or SA2010 these days, but come 2015 we will have a new SA2015 series of helmets making the SA2005 obsolete for most organizations. I recommend not skipping out on purchasing a helmet if you are a rookie with an upcoming trackday, after all having a proper fitting and safe helmet to protect your head if you ever were to have an accident on track is priceless. Airlift makes a direct bolt on air suspension kit for most Subaru models as well as other makes and models. In my opinion Airlift Performance makes the best kit for the Subaru market. Airlift uses a threaded body monotube strut with adjustable 30-level damping and camber plates front and rear (depending on application). In addition to the damping adjustments, you can adjust the spring rate with air pressure as well. Airlift uses push to connect fittings on almost everything, including the air strut and ecu, which makes installation of the airlines very simple. Airlift has a double bellow air spring for the front suspension and they use a sleeve style air spring for the rear. The double bellow air spring in the front struts will provide tons of lift, a smooth ride and a progressive spring rate, which will also provide a better load capacity. 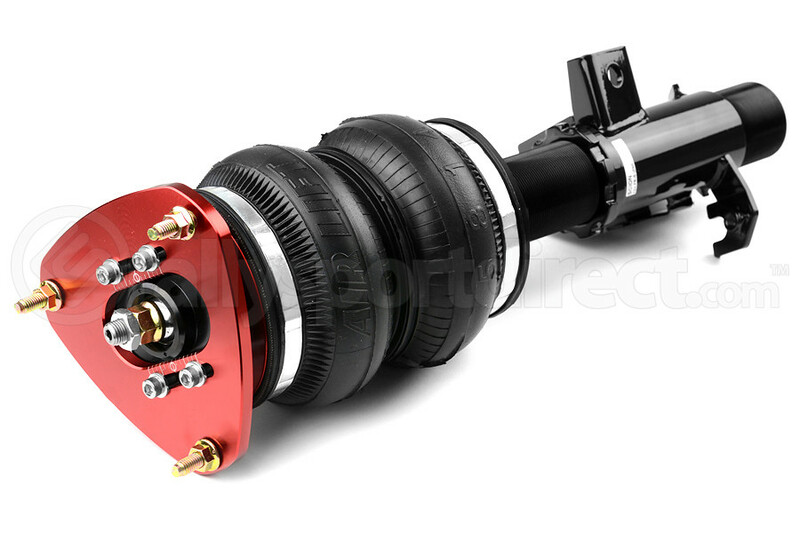 The rear sleeve style air spring is a lot smaller in diameter and will have a more linear spring rate. Sleeve style air springs are best suited for the rear of the vehicle as they have fewer load capacity requirements. 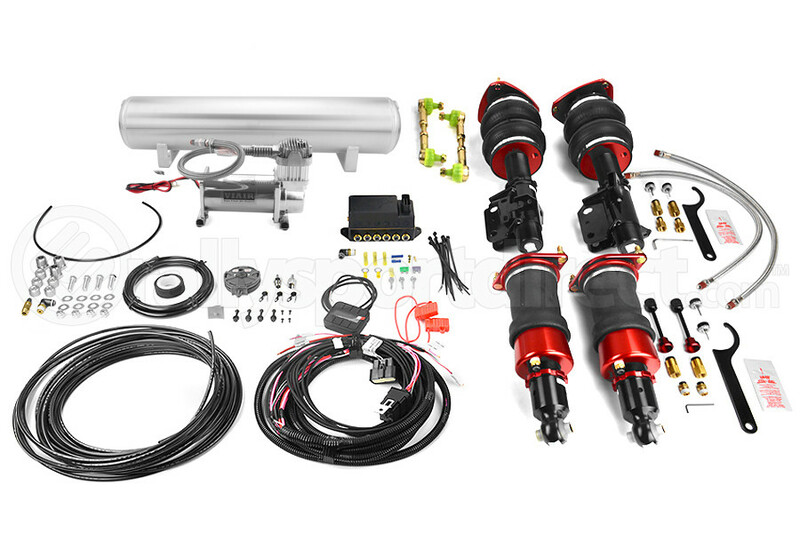 Most common question about air suspension: Is air suspension worth it? If you want the ability to drive low and park even lower or get over speed bumps without bottoming out your car, then yes I think it is 100% worth it. Another thing with Airlift is they have track driven cars that use their suspension and it holds up to the task. Now given it is not designed to be a full track suspension, but with the dampening and adjustability you can drive the car hard and still have fun with it. Suspension management system: Air Lift Auto Pilot V2: It is a simple pressure based system that works surprisingly well and is very user friendly. The cool thing with this system is it has about 8 different presets that you can program and recalibrates it-self automatically, which is nice. Set it and forget it: This system includes its own computer which saves presets, monitors the entire system, and tells the compressor when to turn on and off. There are different settings and you can customize just about anything including tank pressure, response time (lifting & lowering) and auto lift on start up. The control unit displays the pressure in the tank and in each bag, which is very convenient because you don’t need separate gauges to monitor those pressures. Overall I feel that this air kit is one of the best bangs for your buck.It allows comfortable ride, a lot of height adjustment, simple to install, and simple to use. It really is a plug and play setup, which for me is something that is very convenient.I feel that air ride has come a long way since it was first introduced and will only keep getting better and better. I urge you to try it out for yourself. Sway bars, or stabilizer bars are one of the most popular upgrades for suspension and there is very good reason for that. Today we are going to discuss why they are one of the most beneficial upgrades you can do and we will also help you decide which setup is the best for you and your driving style. One of the most common questions we get is “Which sway bars are the best?” That is an open ended question because one is not ‘better’ than another, but there are some very distinctive differences depending on what sizes you use and how the front compares to the rear. The sway bar’s purpose is to keep both wheels (left & right) at the same level, which reduces body roll and keeps your car from being sloppy in the corners. When you see a car lifting a wheel on the track in a corner that is generally the sway bar trying to equalize the force on both sides of the suspension. The outside wheel is forced up in the fender and the sway bar brings the inside wheel up into the fender as well; hence inside wheel lift. Subarus come from the factory with a larger front sway bar than rear and that creates a fair amount of understeer, which is generally not desired for a sharp and responsive ride. Understeer will make the car feel like it is pushing the front end to the outside of the corner, whereas oversteer will bring the back end out and point the front end to the inside of the corner. The most common setups for Subarus are either matching sizes front and rear or having the front bar one size bigger than the rear. Matching your front and rear bars will make the car feel neutral in the corners with a little bias towards oversteer. Having a slightly larger bar in the front will retain a lot of the stock handling characteristics and some people prefer that, but I personally like my AWD cars to be somewhat tail happy with a fair amount of oversteer. You can debate back and forth which setup is better and why, but at the end of the day it comes down to personal preference and nobody is right or wrong. If you like how your Subaru handles from the factory, but want it to stay flatter in the corners, then stay with an understeer setup and use a slightly larger bar in the front than the rear. If you are not sure whether you prefer oversteer or understeer, then adjustable sway bars of the same size for both front and rear will probably be best for you. The adjustments won’t make your 22mm sway bar a 24mm or vice versa, but you can adjust the tension of the sway bar so your 22mm will perform like a bigger or smaller sway bar. Whether you know how you want your car to handle or not I recommend adjustable sway bars so you can fine tune your handling to best suit your driving style. 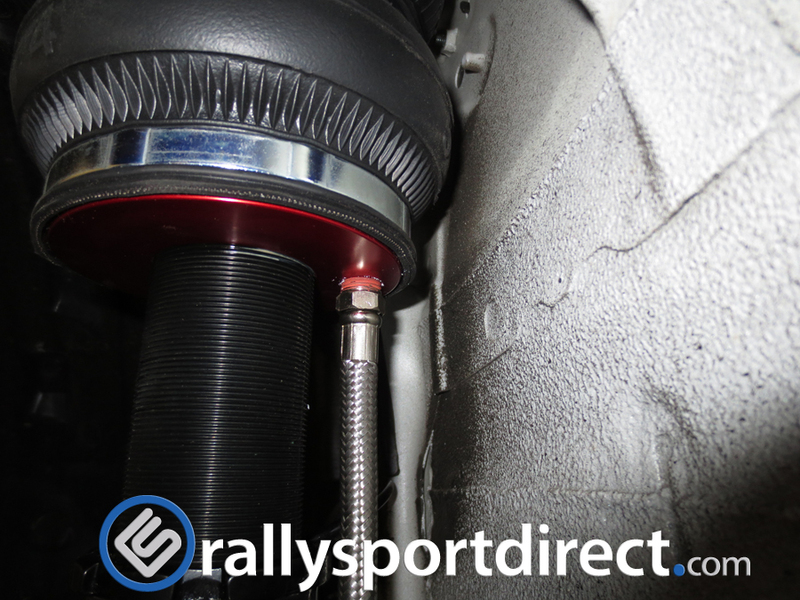 You can make the adjustment by changing where your endlink connects to the sway bar and the closest hole to the bar itself will be the stiffest setting. Stiff setting shown above. This is not a Subaru and is just for reference to show the soft/stiff setting holes. Some people prefer to not have any adjustments because they can’t decide exactly what they like, and there is no shame in bolting on non-adjustable bars and enjoying them for what they are right out of the box. I’m the type that likes to tinker with settings until they are perfect, but sometimes it is not worth the extra time to find out that your fine tuning just made things worse and you get to do it all over again. There is a lot more to sway bars than we have covered so far, but you should now get the gist of what they are, what they do and why you should have them. We will save the more technical side such as hollow versus solid for another day. If there is one thing that I want you to take from this article, it is one sway bar setup is not better than another because one person’s preference could be the complete opposite of another. Just because your buddy is running a bigger bar in the front that does not mean his setup is better than your matching front and rear bars, but they might try to convince you otherwise. We could go on and on about how you could setup your sway bars, but the best way is to find out for yourself. With the popularity increasing the last few years of using aftermarket drive shafts , we wanted to go over some information in regards to the subject and cover some common questions that we see our customers ask us about. The reason to change out the drive shaft to a Aluminum or Carbon Fiber unit is quite simple, it is to reduce rotational mass and increase response. By replacing the heavy stock steel drive shaft with a lighter 1 piece unit you save about 1/2 the weight in most applications, and allow more energy to go into rotating the tires instead of rotating dead weight. Similar concept as doing a lighter flywheel and pulley, however other additional benefits are also to be had. Many new modern cars are now coming equipped with light weight shafts for the reasons of performance, such as the GT-R and other high end exotics. 2 of the most popular materials to use when replacing the steel shaft will be either aluminum or carbon fiber. Below I will cover some of these basics. 1)CF shaft is smaller in OD to handle the same tq capacity as the aluminum counterpart unit. Means you have more clearance and requires less modification under the car to run a carbon shaft vs aluminum. Some applications require modification to heat shields or transmission tunnels to allow adequate clearance for the larger OD Aluminum shaft. 2) The CF shaft has a higher critical speed. For example an aluminum STi application shaft start to flex and vibrate above 155MPH do to the aluminum hitting its natural frequency. The CF shaft is closer to 195MPH. It might not sound like 40MPH is a big difference, but a Stg2 STi can get very close to 155MPH…to hit 195MPH you got to have a crazy fast car (well in access of 500WHP to hit that, and only a small hand full of tracks in the world have straights to accommodate that). 3) CarbonFiber has a much higher ability to withstand load in the application of fiber lamina direction compared to an equally as thick aluminum tube. This makes the shafts much stronger due to a higher yield strength required to load the shaft beyond a paint of failure. This will directly apply to shock load capacity of the shaft without fracture or damage. For instance your typical 6061 aluminum has a Tensile Yield Strength of 40,000PSI, which sounds very high. Now Carbon Fiber is between 3,000psi-15,000psi(depends on the quality of the carbon, either industrial grade or military grade) in the fiber longitudinal direction. So you now might think that aluminum shaft will be stronger, but wait. The thing about carbon is you use more than 1 layer when creating a part, so after you stack 4-10 plies (depends on manufacture) you can see that your tensile yield strength x number of plies = sky high yield strength! From there you can take into account the density of carbon fiber and can see the benefits. *Please note there is much more that goes into these shafts then just sticking plies of carbon fiber pre-preg together, but it gives you the basic idea. If you are having issues breaking your rear axles, or ring and pinion this might be a good way to prolong the life of those parts. Reason is that the carbon drive shaft will be like a rubber band, when launched hard it will twist slightly to absorb some of the shock and then spring back to its normal shape. The twist would be minimal (only a few degrees 5-10) on VERY hard launches, however that twist is absorption of energy. Thing that breaks many parts such as gears is shock to the part from abrupt and high application of power. F=M*A, so if you slightly reduce the acceleration of the power application you prolong life of components. *simple way of thinking this, you can put a 10lb hammer on your finger slowly with no damage, however if you slam the hammer you will do allot of damage. Similar concept with the carbon shaft twisting slightly, as it slows down the application of the energy on the component. 4) When the CF shaft fails, the fibers will come apart and un-wind. When an Aluminum shaft fails…well you have a 14lb sledge hammer spinning at over 10000RPM going to town under the side of your car and you just hope it does not penetrate. The big concern many people have with the CF units is the CF shaft separating from the metal yokes. The adhesive that actually holds the 2 together, how its assembled, and how its cured is a trade secret of these manufactures as this will separate many of the manufactures and really make or break a manufacture. 5) A equivalent CF shaft will be about 5-10% heavier then a Aluminum counter part. 6) Aluminum shafts are only about 30-50% of the price of the aluminum unit. So what one to get? This strictly will depend on your application and budget to be honest. Overall both aluminum and CF are significant improvements over the stock unit. But the CF will be better then Aluminum as its safter, smaller diameter, has a higher critical speed, a better elasticity, and higher degree of torsion before fracture/separation. However that is not saying that aluminum is a bad, as aluminum shafts have been used for decades before the composite technology got to the point where it was better and more affordable for this type of application. Weight Savings of 13.4lbs means that your engine spends less energy rotating the driveshaft and more energy on spinning the tires. This in turn decreases drivetrain power loss and increases power at the wheels. So even though your car is not making more power, its able to transfer more of it to the wheels increasing performance, drive-ability, and response. After installing it on our 2011 STi shop car, we where nothing short of amazed. The fitment was spot on and was a direct factory replacement. Install time was about 10 min after the mid pipe was removed off the catback. Test Drive Results where nothing short of AMAZING! The vehicle was much more pleasant to drive in very low RPM with no more bucking or shacking, and it was much more eager to accelerate even at partial throttle. Throttle input response was also drastically increased with less “dead” time between when the throttle was applied to when the vehicle started to accelerate. As for all out acceleration, well the thing is MUCH faster then compared to the way the car was with a stock driveshaft. The vehicle is much more eager to go through the RPM range at a much faster rate, meaning that its accelerating faster. The shifts where also crisper and faster as up shifts and down shift delays where cut to a minimal in terms of hard downshifting and fast upshifts. We where curious to see the results the addition of the driveshaft made, so we did a quick dyno comparison of before and after. As you can see, consistently through out the entire powerband both Tq and Power increased! *sorry about the starting RPM range, it was getting later in the day and we didnt think twice about the starting RPM of the initial pre-driveshaft starting point. But you can see that after 3000RPM the gains are nice and constant.